The sidebar panel is a host for a number of widgets that provide fast and convenient access to frequently needed information, such as recent emails or the task list. By default, the sidebar panel is located on the right side of the page. However, subject to the configuration settings of your organization, there can be a sidebar on the left, two sidebars (on the left and on the right), or no sidebar at all. The location of the sidebar is defined by the system administrator for the whole organization. Recent Emails widget: Set up the widget to get access to your emails in one or several of the synchronized mailboxes, or to all the emails in your OroCommerce mailbox. Sticky Notes: Place free text notes and reminders. Task List: See the most recent tasks assigned to you. To add a new widget, use the + button, as described in the section below. Click + to add a widget, then select the widget type and click OK button. The newly added widget will appear on the sidebar, below the existing widgets. To reorder widgets on the sidebar, drag and drop them with your mouse. You can add more than one widget of any type if necessary. 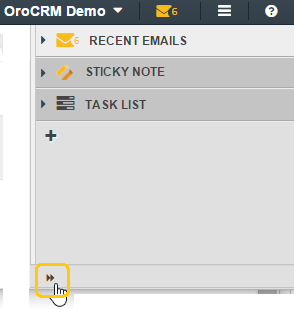 For example, you can stick any amount of notes or follow several different email folders or mailboxes that are synchronized to your account in OroCommerce. Initially, the sidebar panel is minimized. Hover over the icon to see the widget header. In order to expand the sidebar panel, click the double-arrow at its bottom. Now you can see the widget headers. To collapse the panel back, click the double-arrow again. Click the icon on a minimized bar. Click the triangular arrow next to the header on the expanded bar. To fold the widget, click the triangular arrow again. To reorder widgets on the sidebar, drag and drop them with your mouse. This works in both the collapsed and expanded states. This way, you can keep some of the content visible at all times, and keep fewer used widgets minimized. As shown below, each widget contains a header (1), content (2), and icons (3). Refresh the content (e.g., load the most actual emails or tasks) with . Get to the widget settings with . Delete the widget from the sidebar with . Click x to close the widget (appears only when the panel is minimized). You can add several widgets of the same type and define different settings for them. For example, you can keep notes with different content, or email widgets for different folders. This section describes the three sidebar widgets available in OroCommerce out of the box. You can find more information on dashboard widgets in the corresponding Dashboard Widgets topic. The widget informs you about new and unread emails, and gives you a convenient way to access them. 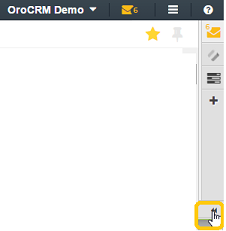 Access the All Emails page and see all your emails available in OroCRM: click the My emails link (1). 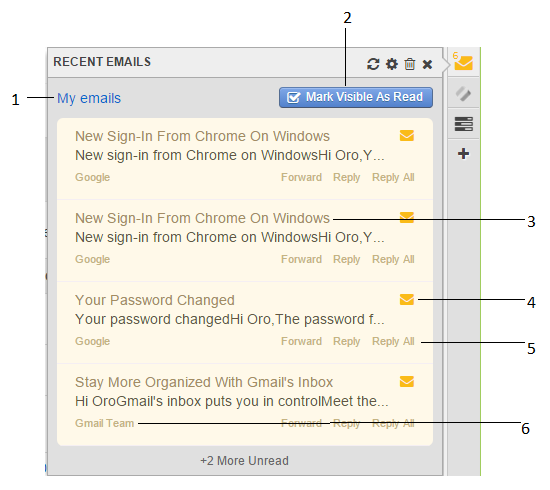 Mark all the visible emails as read: Click the Mark Visible As Read button at the top (2). 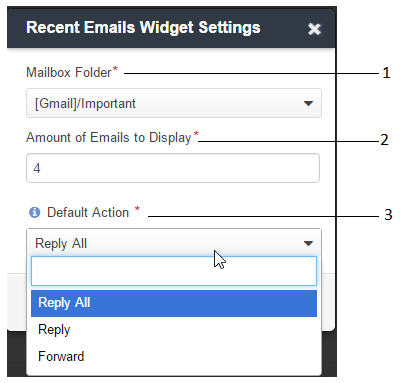 Reply, reply all, or forward the emails: All these actions are available as links below the email header when the widget is expanded from a minimized tray (e.g., 5). (If the panel bar is expanded, only the default actions will be available). Get to the view page of the user from whose mailbox the emails have been sent (if available): Click the user name below the letter (e.g., 6). The widget can be configured to display all the emails from your OroCommerce mailbox or from any specific folder or mailbox that has been synchronized (1). You can change the number of emails displayed (2). You can define which default action is shown if the sidebar panel has been expanded (3). To make sure you don’t miss some particularly important emails, configure your mailbox to sort them in a specific folder, then configure the widget to display this folder and place it at the top of your sidebar panel. Sticky notes are a great way to keep reminders and memos. 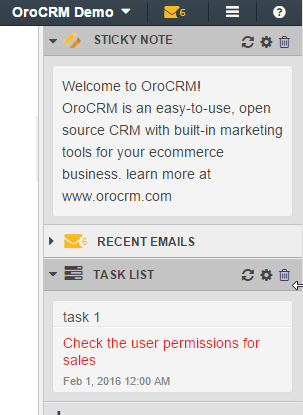 You can keep them organized in your OroCommerce sidebar panel. Click the to change the content of a note. 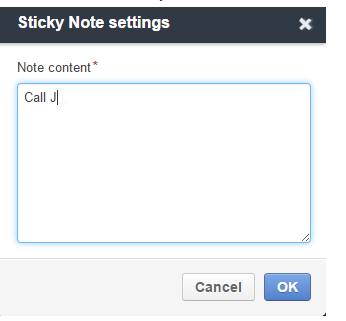 You can keep any number of sticky notes in the panel. If the panel is expanded, you can minimize some of the notes, and keep others visible (such as those that are due today). When you don’t need the note anymore, you can easily delete it. This widget displays tasks assigned to you. For more information about the sidebar, see the Sidebar Panel topic. Tasks in the list are represented by their subject and due date. Tasks are ordered by their due dates in ascending order—the earlier a due date, the higher on the list a task is displayed. Overdue tasks appear in red. On the minimized sidebar, click Task List on the sidebar to expand the widget. On the maximized sidebar, click Expand on the sidebar to expand the widget. Click Refresh on the widget’s header to actualize the list of tasks. Click Configure to update/set the parameters for a widget. 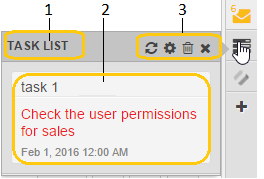 To change a number of displayed tasks, enter the required value into the Number of tasks to show field and click OK.
Click Delete to remove the widget from a dashboard. On the minimized sidebar, click Close to collapse the widget. On the maximized sidebar, click Collapse to collapse the widget.